A geomembrane is considered a very low permeability (low leakage rate) liner made out of synthetic (man made) material. 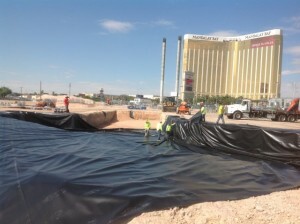 Usually the phrase geomembrane liner is used by engineers or people who have had experience with liners. They are often more technically savvy when it comes to the physical characteristics of a liner so that they can understand if a particular liner will work for a specific application or not. The phrase geomembrane liner or liners is normally used for the larger size liners. These liners are regularly specified in blueprints for large projects where a geomembrane liner is a necessary requirement and where a specific type of liner is specified. 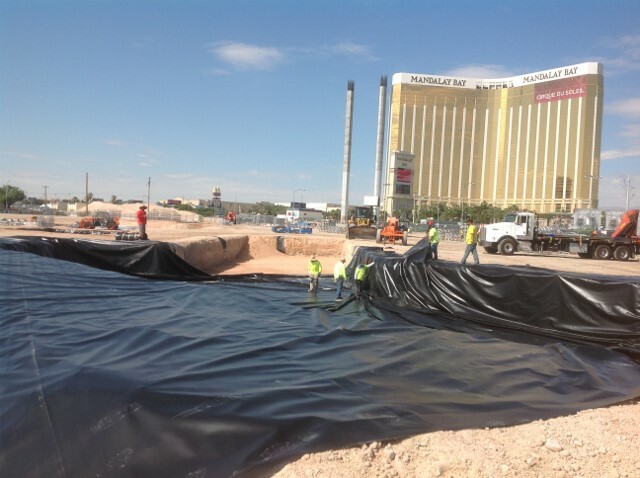 The word Geomembrane is also regularly used for the containment of hazardous liquids that could contaminate the ground or surrounding structures if not contained correctly. Usually greater detail in selecting the correct liner material in these situations can be more essential than buying an off the shelf standard pond liner material. Using the word geomembrane can often mean that the chemical resistant properties of the liner will be heavily focused on. Geomembranes consist of all pond liners, even fresh water or fish pond liners, but the general public often does not know the terminology. The liner community is working hard to educate people about what a geomembrane is so that individuals and businesses can make the correct decisions when looking for a geomembrane liner. This will allow potential liner customers to have a better understanding of the wide variety of materials that are available on the market today so they can make the best decision when choosing a liner for their specific application.